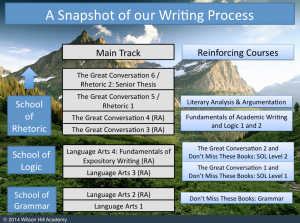 Writing instruction at WHA begins with Language Arts in the Grammar School and continues through the School of Logic and School of Rhetoric years, culminating in Rhetoric 2: Senior Thesis. The primary goal of our writing process is to teach students how to write coherent, logical, and elegant essays. To accomplish this, students need a solid foundation in writing, which our Language Arts courses seek to provide. Each Language Arts course consists of engaging literature, comprehensive grammar, and essential composition skills, each part reinforcing the others. As students progress through the levels of this integrated curriculum, they are continually becoming stronger readers and stronger writers. The literature selections become the basis for learning the grammar skills, along with the tools necessary to create exceptional writing assignments. The goal is that students be well-prepared for the upper-level coursework that will follow in later years. Through these intertwined practices, students who work through the entire series will gain a practical understanding of English language arts so that they can read complex works with understanding and write well-reasoned essays with clarity and correctness. LA1 is the introductory level in this sequence, typically appropriate for 5th graders or advanced 4th graders. Throughout the year, discussions, debates, and projects will assist the students, and encourage a love of reading as they connect personally to the unique characters and storylines. Poetry, memory work, dictation, and copywork are incorporated weekly, providing opportunities for the students to be involved in the class in a myriad of ways. As biblical truths are discussed and identified within each story and its characters, students are encouraged to share how this impacts their daily lives. The Grammar & Writing curriculum is available as a PDF for downloading. An official book list will be be available below by April 15. LA2 builds upon a student’s foundational understanding of parts of speech, sentence purpose, and sentence structure and furthers this understanding through the parsing and diagramming of sentences as well as the application of capitalization and punctuation rules. It is typically appropriate for 6th graders, advanced 5th graders, or 7th graders who need to cement their understanding of fundamental grammatical constructs. The course continues to rely on great works of children’s literature and provide an integrated approach to grammar and writing instruction. Students build patterns of excellent sentence and paragraph structure through exposure to poetry, recitation projects, copywork, dictation, and imitation. Students also have the opportunity to exercise rhetorical skills through classroom discussion, debates, and writing projects. While first semester focuses on creative writing through modeling exercises and the application of literary techniques, second semester requires students to support themselves with textual evidence and analysis. This engagement of literature challenges the students to search out beauty, truth, and goodness and apply biblical truths to their daily lives. Finally, daily poetry reading will enable students to explore eloquent expressive forms and learn how to use the English language more effectively in their own writing. An official book list will be available below by April 15. LA3 students will read short stories, novels, and poetry, exploring fundamental literary elements in the process. By digging into these works, students will learn how to understand and evaluate what they read with more maturity and insight. They may even gain insight into themselves and the world around them! The literature selections will also provide the basis for writing assignments. Students will review and practice the elements of quality sentences modeled from the literature. From there, students progress to a variety of paragraphs. With that solid foundation in place, students will learn how to construct effective literary essays. Students will write frequently in a variety of modes. A third part of this course will be a comprehensive study of the logic of grammar through the traditional practice of diagramming sentences. When learning a grammatical concept, students will also observe the concept exemplified in the literature selections and then will write sentences modeled after that grammatical syntax. Students will also apply grammar knowledge when editing their writing. Exploring fundamental literary elements, LA4 students will read short stories, novels, a Shakespearean play, and poetry. By digging into these works, students will learn how to analyze what they read with more maturity and insight. The literature selections provide the basis for writing assignments. Students will review and practice the elements of quality sentences modeled from the literature. From there, students quickly progress to a variety of paragraphs. With that solid foundation in place, students will learn how to construct effective literary essays. Students will write frequently in a variety of modes. Though LA4 does not include a separate grammar program, students will observe advanced grammatical constructions exemplified in the literature selections and will then model those constructions in their writing. In addition, students will review grammar as needed to address errors in writing. An official book list will be available by April 15.